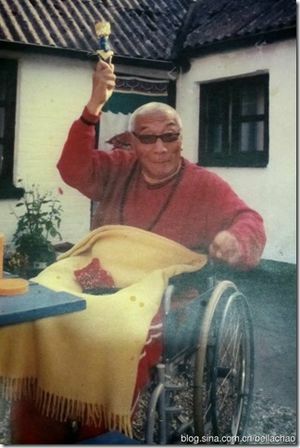 Gangna Rinpoche (Tib. སྒང་སྣ་རིན་པོ་ཆེ་, Wyl. sgang sna rin po che) aka Dongna Tulku (1924-2003) was an important disciple of Jamyang Khyentse Chökyi Lodrö. The thirty-fourth lineage holder of Gangna, named Sherab Chökyi Senge, was recognized by Jamyang Khyentse Chökyi Lodrö as a reincarnation of Jamyang Khyentse Wangpo and Gyurme Tsewang Gyatso. In the latter part of his life he lived in Bir, India. The Gangna Labrang at Dzongsar belonged to the Ngor Khangsar Labrang. This page was last edited on 14 February 2018, at 20:55.